Airtel Rs. 289 prepaid mobile recharge plan has been launched in India. Here are details on the new prepaid plan from Airtel. The Airtel Rs. 289 prepaid mobile recharge plan comes with unlimited local, STD and roaming calls, 1GB of total 3G / 4G data for the whole validity period and 100 SMS per day. This Airtel Rs. 289 prepaid recharge plan doesn’t come with any FUP limit on the unlimited voice calling benefit. The validity of this plan is of 48 days. It doesn't matter whether you're a 2G/3G/4G device user, as this latest Airtel Rs 289 prepaid plan comes with 2G/3G/4G data. However, this plan not available to subscribers in Delhi and some other metro cities. Another telecom, Vodafone also recently launched the Rs. 279 prepaid plan which comes with a validity of 84 days and offers benefits such as unlimited local, STD and roaming calls, 4GB of 3G/ 4G data and free SMS. However, in Vodafone Rs. 279 prepaid plan, unlimited voice calling has a FUP limit of 250 minutes per day and 1,000 minutes per week. How to avail Airtel Rs 289 Prepaid Plan? 4. Once your Recharge is done, you can enjoy unlimited local, STD and roaming calls, 1GB of total 3G / 4G data for the whole validity period and 100 SMS per day. Huggies is back with a free diapers offer where you can get free sample of Huggies Diapers for new born baby just by entering few details. 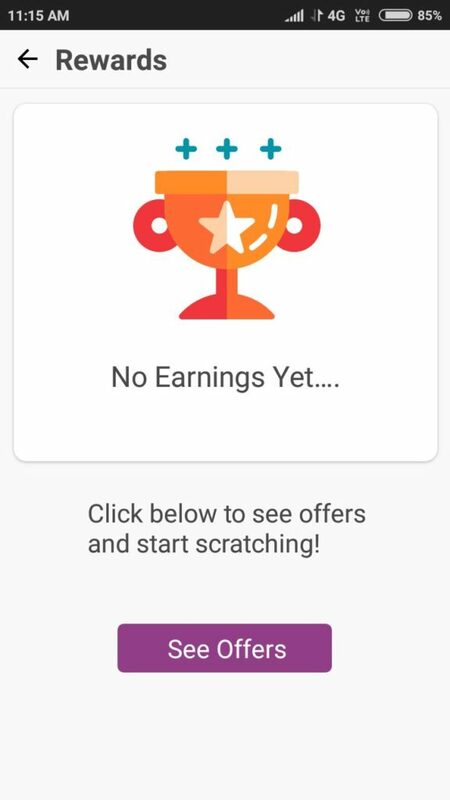 Offer is valid for all user. Please note that the samples are only available in Newborn and Small sizes. Please select your preference below. Your requested sample will reach in 15 working day from the date of applying for one. So hurry up and follow all process and get free sample. How to Get Free Sample of Huggies Diapers? 2. Enter Name, Address, Email etc. 3. Select Mother in Relation & Only 3 Month Baby. 5. That's it! You will get Huggies Diapers Free Sample within 15 days. Answer a simple question to bag your free sample of Sanifresh Germ Guard now! Keep your family safe and your toilet germs free. The all new SaniFresh Germ Guard comes with an advanced thicker formulation and 10X superior cleaning property that gives faster, better and efficient cleaning. It helps to keep the toilet safe from germs causing diseases and your family safe and healthy! How To Get Free Sanifresh Germ Guard Sample? The participant eligible for the free offer (hereinafter referred to as the “Participant”) can be a female, between 25 – 44 years of age, SEC – A and B, and Indian residents only living in India. 2. Now You will be Asked a Question? 3. Answer This Question as All Of them. 4. Now Fill Your Details, Address & Other Things. 5. Press Submit & Submit Your Details.Once You Submit the Form You will Get A Free Sanifresh Germ Guard according to their terms & Conditions which are given Below. Participant should have a firm contractual capacity. Offer would be live on our website http://www.700se7kadam.com/germguard/ from 21st November 2015. Participation is optional and constitutes acceptance of these Terms and Conditions. No entry fee or purchase is required for participation. Participants are entitled to one free sample per entry i.e. 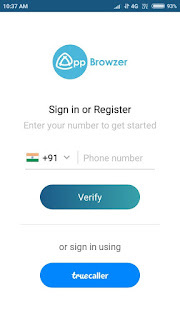 per mobile number, per email id and per address will get only 1 sample. No single user will get 2 samples. Only first 1,000 correct entries will be eligible for free samples of SaniFresh Germ Guard product, and the winners will receive them through courier. The organizer holds the right to extend the samples beyond 1000. Under any circumstances, Dabur shall not be responsible for any medical and / or health related issues. Decision of Dabur shall be final. By entering the Competition, the participant agrees to be bound by these terms and conditions and by any other requirements set out in the promotional material accompanying the competition..
Any issue arising relating to the Contest shall be the subject matter of jurisdiction of the Court of Delhi. These terms and conditions shall be governed by and construed in accordance with the laws of India. The Organizer reserves the right to change these terms and conditions at any time without notice. AppBrowzer App– Refer & Get Scratch Card Upto 9 to.49 Rs,AppBrowzer,This App is Giving Free Scratch Cards Like Tez App & PhonePe App. as the name suggests, works like an App Browser. 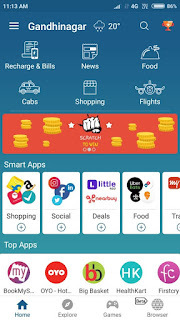 It is all in one online shopping appfor all your daily needs and gives instant access to online shopping apps like Flipkart, Amazon, Snapdeal, Shopclues, PayTm and several other apps for online mobile recharge, postpaid mobile bill payment, price compare, booking cabs in one app, movie tickets, online mall, flight booking, train booking, deals, latest offers, coupons, news, deals India, home shopping, ordering food, pay bills and more. It is recognized as the best all in one app for productivity by 50K+ daily users. Having 200+ instant Online shopping apps, This browser is all in one online shopping app helps you to save your time as well as your phone's space. 2. 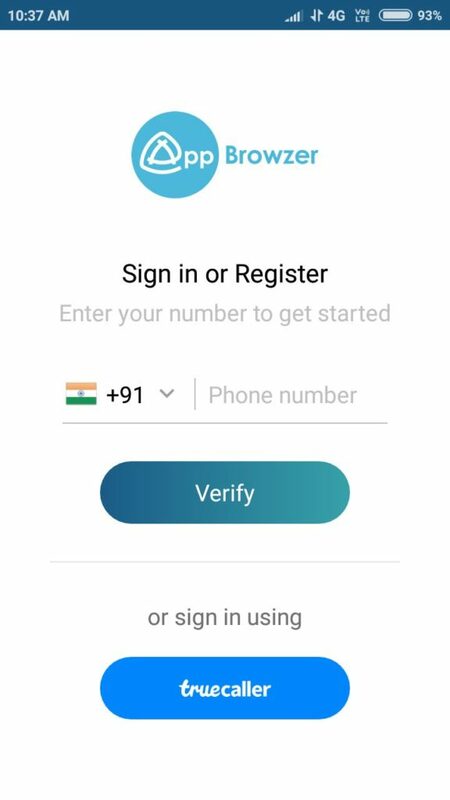 Allow All permissions and Sign up using your mobile number. 4. You will be on dashboard of the App after verification of OTP. 5. Now Go to Menu Option and Select Offers and RewardsSection. 6. Select See Offers OR Share Option from Menu and Share your Refer Link with your friends. 7. When your Friends will Join Using your Refer Link you will get a Scratch card. 8. You can redeem your Scratch card by Paytm or any other available methods. 9. User can earn a maximum of 50 Scratch card for this offer. 10. You can Earn more by Installing apps in your phone. 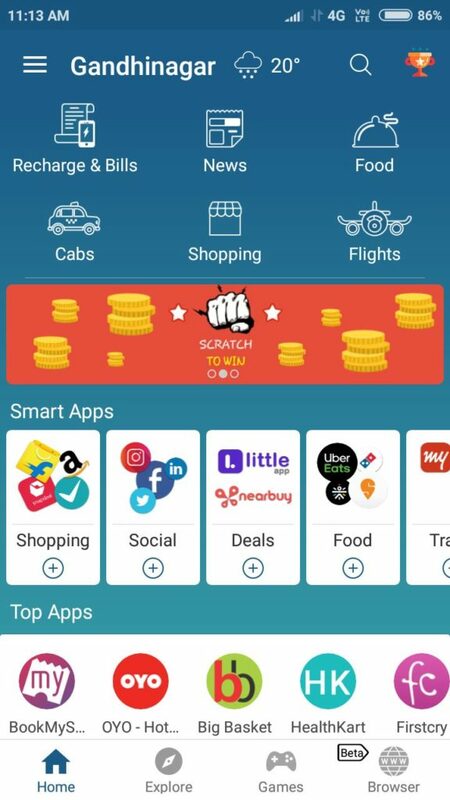 - All cabs in one app : Browse, compare price online and book cabs at one place. - All deals in one app : Find best deals, offers and coupons everyday. - All social apps in one app : Stay connected with all your favorite social networking platforms. - All online shopping apps in one app : Have easy access to various popular shopping apps at one place. - All recharge apps in one app : Save time and money while recharging mobile, DTH and other online payments. Download the AppBrowzer (All in one online shopping app) and start enjoying its immaculate app browser competence. Storage space will never bother you again with this browser.